As if the annoying chump who prominently displays his Treo and claims he has $100k worth of work on it wasn't aggravating enough at social outings, this one is sure to tip off your douchebag detector. The modded Nokia 3200 goes from chic to geek in just under a couple decades. 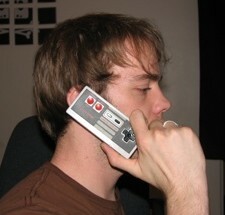 Although the boys over at Joystiq love to push buttons, the NES controller cell phone may just push yours. There's already enough geek-shirts for boys with toys to be giddy geek groupies, no one needs a Nokia nerd to pull out his NES controller just to wait for people to give the not-so-candid 'what's that!?' question attention. Hello, 1984 called, literally. That may be the nerdiest thing I've seen in months. Wow. Some weird inventions like this are cool, like the beer launching fridge http://www.duke.edu/~jwc13/beerlauncher.html but that phone just isn't.